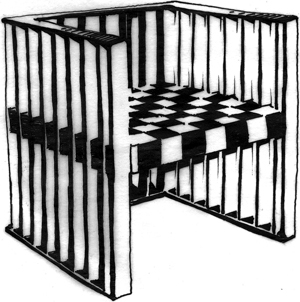 In three months of intensive research in archives, collections, libraries and numerous discussions with experts, we could not find a single piece of convincing evidence that Josef Hoffmann is the creator of the armchair shown, and we would like to emphatically advocate for the posthumous copyrights of Koloman Moser! We discovered that there is a remarkable discrepancy between scientific fact and public opinion! From the time of origin of the armchair shown (known colloquially as the “Purkersdorf chair” because it was used in the entrance hall of the famous Purkersdorf sanatorium; previously, in 1903, the armchair in question was included in the XVII Exhibition of the Vienna Secession), there are only references to Koloman Moser; we could not find a single reference to the authorship of Josef Hoffmann. It was also documented that Koloman Moser had designed two very similar models/variants for the Prag-Rudniker wickerwork factory. Moreover, there is no evidence of any collaboration between Josef Hoffmann and the Prag-Rudniker wickerwork factory. Then for a few decades no one seems to have had any interest in this chair. But in the 70s, with the start of series of furniture reproductions by an Austrian company, an interesting twist came about. The re-editing manufacturer sold the armchair in a collection called “Hoffman Recreation” as the “Purkersdorf chair”, and served as a source for numerous publishers, exhibition organizers, etc. 2 to Koloman Moser and Josef Hoffmann together. Numerous discussions with dealers and experts confirm the overwhelming consensus of the publications we have seen. But we could not find a single piece of convincing evidence that Josef Hoffmann is the creator, and we would like to emphatically advocate for the posthumous copyrights of Koloman Moser!